Simple and quick: A good note taking app needs to be quick to open and get to the point at which you can start taking notes. You don’t want to always be leaning over, asking the person next to you to repeat what was just said. Typing should be simple, without the need to work out complex margin settings, hanging paragraphs, line spacing, and more. You need to get that text down quickly and easily. Organized: Most people take notes as part of some ongoing process. Ideally, the system or app you use has a built-in format and flow for organizing your notes. Set up one folder for Biology and another for English. Set up a folder for one class and subfolders for individual projects. Notes should easily fit in the right category and have a simple flow so that everything you need is there in sequential order. Always available: Apps that have an accompanying website service and interface are always a good choice. It helps to know that your notes are available in a common location that every device supports. These days, every computer and device has a web browser, so an app that provides secure web access to your notes is a plus. Cloud storage and backup: Back in the day, if you lost your folder with months of notes, you’d more than likely start hyperventilating. Digital storage is simple these days. Don’t use an app that uses the iPad as its primary storage location and relies on you to synchronize your files in order to create a backup. Select a solution that allows simple and automatic cloud storage. Search: A bonus is the capability to tag your notes with keywords and an effective search function to find whatever you need easily. Images, sketches, sharing and more: You’re using an iPad! Your note-taking app should take advantage of the capabilities it provides. It’s helpful to use that camera to add a quick picture of a document or a whiteboard to your notes. Sketch something in your note with your finger or stylus. Record a snippet of important audio. E-mail your note to someone else who needs it, or even better, share it so that groups of people can have access. 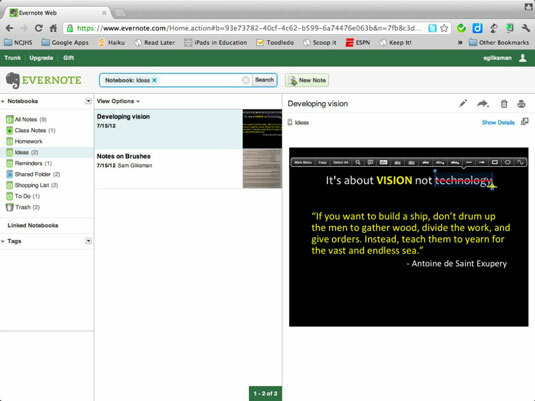 Evernote: Evernote has all the features you might want from a note-taking app. It excels in organization, storing notes in notebooks that you can create and share, while allowing you to add all types of digital content within your notes, including audio, images, and even websites. Your account is also available from any device and through the Evernote website itself. 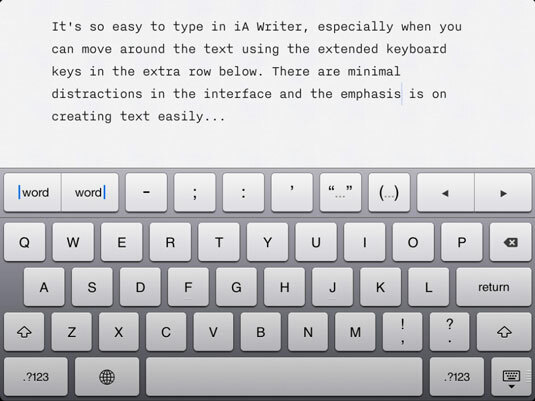 iA Writer: iA Writer is a fantastic app for simple text editing but it’s text and only text. One huge feature is a much-needed extended keyboard (hello, Apple?) that adds keys for those simple functions such as moving through text letter by letter or skipping through it word by word. Dropbox and iCloud integration is provided as well, but organization of notes is not very intuitive. If you prefer creating handwritten notes, then you should take a good hard look at Notability. Notability allows you to create notes using your finger or a stylus, actual typing, drawings, audio, and images.